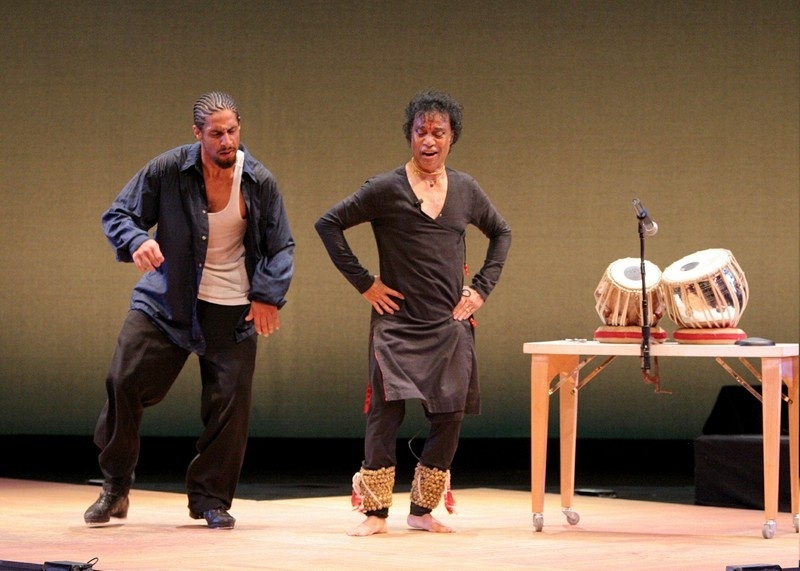 India Jazz Progressions is the child of India Jazz Suites, itself the offspring of a serendipitous encounter between tap dancer Jason Samuels Smith and Kathak artist Chitresh Das in the hallways of the American Dance Festival three years ago. The sparks-shooting two-hour show had the feel of a jam session—the kind of informal get together when artists perform for each other as much as for an audience, inspired by a spirit of curiosity, friendly competition and sheer delight in the companionship of others of similar mind and heart. It helps, of course, when the individual artists are as exuberantly committed as these dancers were. More loosely and not as symmetrically structured as the first show, Das took the opportunity in “Madan Bhasma” to remind us that Kathak comes from “kathaka”(story teller). With “Shabd” (sound) he demonstrated that the art, while rooted in tradition, is capable of innovation and expansion. In “Madan Bhasma” Das danced, acted and mimed a traditional tale in which he took on each of the parts, the villain, the gods and their companions, even the setting. The characterizations were so finely detailed and delivered with the showmanship that is integral to Das’ performing style that the story became quite legible even to the uninitiated. The villain glaree and shook in fear, the demure wife shyly averted her glance, and the young leaves trembled in the breeze. Many of the gestures--who knows how-- found their way in coarsened forms into silent movies and melodramas. “Shabad” (sound) was performed by Das’ exquisitely refined sextet of women dancers who wore with finger cymbals. Their leader Rachna Nivas directed from the harmonium. The piece, a work in progress, features a technique called Kathak Yoga which Das developed as a training method for himself. The dancer plays an instrument—he himself uses tablas--dances, recites the rhythms and chants. It was breathtaking to watch and hear these dancers’ unison formations to then break into smaller units only to melt back into the whole. They always were in tune—both literally and emotionally—in tune with each other. Even though I was unable to catch the full complexity of what the dancers were doing, the simple act of hearing three, sometimes more ever shifting patterns coming from within a single person was a revelation. The program opened with Charlotte Moraga, a luminous and superbly accomplished dancer in Sangham (seekers). Stepping out of the shadows into whipping turns that came out of nowhere, fluidly luscious backbends and vibrating feet that seemed to have a life of their own, she traveled between the Indian musicians stage right to the opposite side where a jazz trio held forth. Since Moraga is an “accidental” kathak dancer—a jazz dancer in high school, she took her first kathak class when the jazz dance she wanted in college was over enrolled—she clearly relished the joyous pull between the two kinds of music. I have never seen her explode with such power from stillness into explosive activity in which she willed the musicians to come along for the ride. Her duet with a lanky, arm-swinging Chloe Arnold had a get-acquainted quality to it in which the two women first warily took each other’s measure and then threw increasingly complex rhythmic phrases into the ring. The stunner of the evening was Dormeshia Sumbry-Edwards’ “Solo”. Physically stocky in a compact and muscular way, she is a master of shimmering beats that she delivered with the lightest of touches. Elegance and ease defined her cappella dancing—with a hand clap or a hop thrown in to punctuate the intricate flow. No wonder the jazz musicians were in awe of her; pianist Jason Martineau gave a spare pointillist commentary while Sameer Gupta’s wire brushes suggested a field of silvery light for her to dance in. Yet with the much more extroverted Smith, Edwards more than held her own in a high flying, chicken-clucking duet that ended with each of them having a leg in the air. I couldn’t help but think that the choice for the rousing, and just slightly chaotic finale of Ellington’s “Caravan,” with its pseudo-orientalisms was a little tongue-in-cheek. Though a splendid tune, it added just a whiff of Bollywood to burn up the stage. Neither Edwards nor Arnold have developed the real affinity for North Indian Classical music that Smith by now has. So in that way Progressions was less well balanced than the earlier Suites. This is an aspect that could be developed more. The only discordant notes in this splendid evening of percussion dance came in repeatedly missed light cues and annoying feedbacks from the sound system.